Cork flooring is making a return to mainstream flooring as an eco-friendly choice. Because it is cork material, a naturally renewing resource, many people are using this amazingly versatile product for their everyday flooring needs. Cork material is incredibly elastic. It has a high rate of compression and great structural memory. It is able to withstand 50% compression with 95% recovery. These properties help with sound and vibration absorption. Acoustic and thermal insulation are the hallmarks of cork products. It is also impermeable to moisture. It is a very buoyant material that has natural microbial and fire resistant properties. No synthetic material can replicate cork’s unique set of properties. These properties are achieved as is a result of cork’s flexible cell membrane and its honeycombed structure. The natural cork oak, Quercus suber (European Cork Oak) and Querqus veriabilis (Asian Cork Oak) are unique trees. The outer bark can be stripped and removed several times within the tree’s lifetime, with little harm to the tree. Since the cork oak can live up to 200 years, this constitutes a steady source of a renewable raw material. Benefits of Natural cork flooring Eco-friendly: Cork is a renewable, reusable, and self-sustaining resource. Natural Cork oaks are not felled for their timbers but are peeled for their bark. This in turn reduces the need for replanting. The owners of a cork orchard may not need to replant their orchard for two or three generations. Soft and comfortable: Cork material has a wonderful cushioning effect because of its compressibility. This makes walking and standing on it a comfortable experience with few down sides. People who suffer from stiff joints, headaches, back aches or arthritis find the impact absorption of cork to be a great comfort. 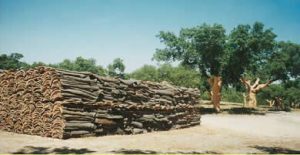 Heat Retention: The honeycombed structure of cork bark means that tiny compartments of air are trapped within the cellular structure. This trapped air provides a layer of insulation against thermal transfer. This low heat conductivity makes cork one of the best insulating materials in the world. It is “Nature’s Styrofoam” without the off-gassing. Not only will you be reducing heating costs in winter but your bare feet will have something comfortable to walk on. Durability: Cork flooring has superior durability to many other types of flooring and it owes this property to its incredible elasticity. This elasticity enables it to recover well from compression and thus cope well with areas of high traffic. Acoustic Insulation: Cork’s cellular structure comes through again. Not only does air prevent heat loss, it also prevents sound and vibration transmission. This is why cork is used as underlay. Cork is a great choice for intensive building projects such as apartment buildings where there is a need to reduce invading sounds. Resiliency: Cork produces a high concentration of Suberin – a waxy product produced by most plant life. The high levels of suberin give cork its anti-microbial and hydrophobic properties. Suberin is what makes cork fire resistant. Suberin also holds the cork together; it is the tie that binds if you will. Cork does not shed its fibres which in turns reduces dust build up. Molds and mildew are unable to establish colonies. All of which make cork material an ideal material for people who are allergy or asthma sufferers. Water Repellant: Suberin’s properties make it ideal as water repellant. The trapped air makes cork float; the suberin makes it water resistant. For these very reasons, cork is a strong candidate for kitchens and baths. Ease of Maintenance: Cork is easy to clean. Because Forna floors are factory finished with three coats of polyurethane, anything that makes its way onto our cork floors is easily cleaned away. The polyurethane does not require “refinishing”, merely refreshing every few years. There is no need to “wax and strip” your cork floor. If the appearance of your Forna floor begins to dim or lose its luster, an application of water based polyurethane acts as a quick pick-me-up. Physically Appealing:Cork material comes in natural shades of honey or natural oak. It can be stained to meet any taste. It is the “soya bean” of flooring products. It can be made to mimic most building materials – normally at a much lower cost than the original. Our products are factory finished and then shipped to our warehouse. This enables our clients to use their floors as soon as possible. While cork is impermeable to liquids and can safely be installed in rooms such as bathrooms, large spills (such as water splashed from the bath) should be mopped up quickly. It is not the cork that requires saving, but the subfloor underneath. When installing cork in a bathroom or kitchen it is important to caulk the perimeter of the room before installing the baseboards. Universal Choice Because of its many superior qualities, cork has been a popular flooring choice in a variety of settings, from schools to hospitals, restaurants to hotels, shops to offices. On the domestic scene, it is suitable for all rooms in the house and is especially good for homes that have children and pets.